I’ve always dreamed of sailing and, much to my surprise, so has Bryan. He had been looking at vintage sailboats for quite some time. I have to wonder if our walks along the harbour at Tobermory this summer had anything to do with that. When he finally approached me about buying one, he was equally shocked that this was something I was dreaming of too. We looked at several more sailboats together but most needed extensive restoration. We saw everything from stripped and destroyed interiors to overflowing bilges and deck delamination. The reality is that Bryan has a fairly high-paced career so a full-project wasn’t a good idea if we ever wanted to get out on the water. Pretty much every vessel was a sloop and I suggested that perhaps we consider a ketch. I prefer the style of a classic ketch anyway. however Bryan wasn’t so easily convinced. Eventually I won him over and one particular sailboat caught our eye—a Classic 31 Grampian built in 1967. We went to check out the sailboat which was up on Lake Simcoe. To make a long story short, we are now the proud owners of the Azura. We’ve decided to keep her name because it suits her and I’m all about how her name is a play on those gorgeous cerulean blues of the sky and water. She has been outfitted for ocean travel and has been to the Bahamas or BVIs on more than one occasion. One day we hope to travel the Intercoastal Waterway out to the Atlantic and down to the Caribbean but we will need to become more experienced before that happens. 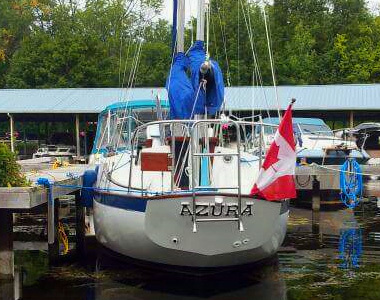 For now Azura will stay on the hard at Lake Simcoe and in April 2017 our beautiful old boat will be transported overland to Port Dalhousie for the 2017 sailing season. We aren’t sure that this will be a permanent home but the people there were very welcoming. We’ve already met a man named Vic—a seasoned sailor who is quite the character and is going to be our port side neighbour. He already offered Bryan sailing lessons. There is a gorgeous trail not too far from the pier where I can do my long runs along the lakeshore before we set sail on Saturday mornings and a lovely park with an antique carousel that I can take Kaia to while Daddy works on the sailboat. Toronto is directly across the water and about a 4-hour sail depending on conditions. We had considered docking somewhere along the shores of Georgian Bay but we’d rather spend the time sailing instead of driving. That and there is much work to be done so being closer allows us to go for an evening here and there. Perhaps in a few years we will consider a spot near Midland or somewhere else in that region. I want to thank Shaun & Julia Sailing, Joshua Scudds, and Nena at Port Dalhousie Pier Marina for taking the time to answer so many of our questions. This photo is courtesy of Azura’s former owner, Renee L.